The Seattle City Council is closing on changes to Mayor Jenny Durkan's proposed $5.9 billion budget for next year but is staying far away from the contentious business head-tax debate. No head tax, no drama? Homelessness concerns continue to dominate budget negotiations in Seattle, but there was almost no debate among City Council members Wednesday as they reviewed how they intend to change Mayor Jenny Durkan’s spending plan. The placid talks stood in stark contrast to budget sessions last November, when council members began a months-long battle over whether to adopt a so-called head tax on large businesses. This time around, the council is poised to tweak Durkan’s budget by about $16 million over two years, including about $8 million in additional allocations to homeless issues and other human services, with an emphasis on shelter and outreach. In total, Durkan has proposed about $5.9 billion in annual spending in 2019 and 2020, up from about $5.6 billion this year. That would be a 50 percent increase from the $3.9 billion budget in 2012, with a population and building boom, inflation and new programs all contributing to the increase. The mayor’s plan would add about $3 million in homelessness-related spending in 2019, for a total of about $90 million. Laying out the council’s likely budget actions Wednesday, committee chair Sally Bagshaw said the package would allow the activist groups SHARE and WHEEL to keep their homeless shelters open through 2020. Durkan’s budget had committed only to keeping the shelters open through June. The council, meanwhile, seems unwilling to replace tens of millions dollars that Seattle’s short-lived head tax was supposed to raise annually for more housing and homeless services. Some advocates say the mayor and council still are putting a band-aid on the ongoing homelessness crisis. Durkan’s 2019 budget would boost spending on encampment cleanups by 17 percent and emergency services by 13 percent, while Human Services funding for housing would rise only 3 percent. Sara Rankin, a Seattle University law professor with the Homeless Rights Advocacy Project, said the lack of a big surge in spending on affordable housing to address the homelessness crisis reflects a mayor preoccupied with not rocking the boat after the head tax controversy. “This budget to me reads like fear,” Rankin said. Since Durkan proposed her budget in September, council members have explored about $202 million in additional allocations. But the budget they intend to pass on Nov. 19 must be balanced, and they have agreed on nowhere near that amount in offsetting cuts. Fund balances, improved revenue projections and minor reductions would allow for $16 million in council allocations under Bagshaw’s plan, which could be amended before Nov. 19. That amount would be similar in scale to tweaks by the council in previous years. Councilmember Kshama Sawant last month called on her colleagues to replace the estimated $57 million annually that the controversial head tax on large businesses would have raised. The council adopted the tax in May but repealed it in June rather than risk having it rejected by voters at the ballot. No other council members backed Sawant. She planned to hold a budget rally Wednesday night. In a departure from Durkan’s budget, Bagshaw’s package would earmark $1.1 million more for SHARE and WHEEL over two years, despite ongoing tension between the activist groups and city authorities. The move would continue a familiar cycle, whereby authorities try to reduce or discontinue funding to the groups, only to see it restored by the council. Together, SHARE and WHEEL operate about 215 of Seattle’s emergency shelter beds, but like most other basic shelter programs, their performance outcomes fall well below goals set by the city. Still, council members have made it clear they don’t want to cut any shelter beds. “If the mayor can come up with something that works better, I’d like to know about it. But in the meantime, we want to know the shelter beds are there,” Bagshaw said. The council’s package also reflects a desire to put more checks on the city’s Navigation Team, which does outreach to and removals of unauthorized homeless encampments. The mayor’s budget would expand the team to 30, with four more police officers. But council members repeatedly have raised concerns about the balance between police and outreach workers and may require the team to report to the council after each quarter in order to receive funding for the next quarter. Wednesday’s package also would add $1 million for drug-treatment on demand, an action welcomed by Speak Out Seattle, a group that has been among the council’s most vocal critics on homelessness. “We favor more expanded medicated assisted treatment,” Speak Out Seattle member Elisabeth James said. 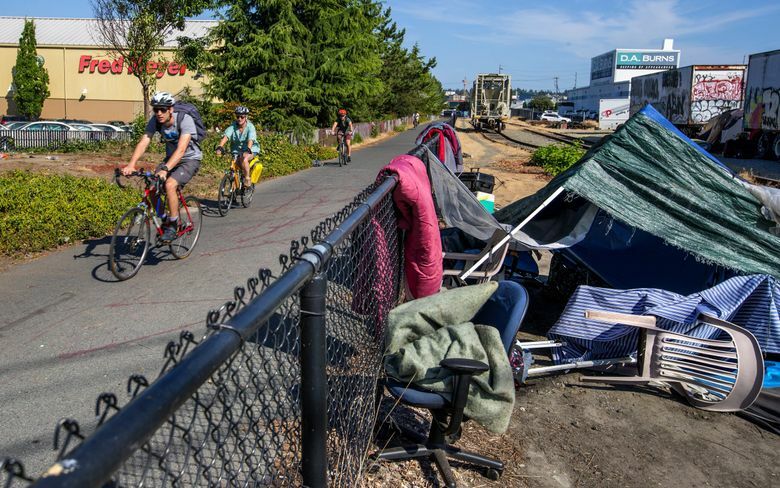 Not included in the council plan is a proposal by Councilmember Teresa Mosqueda to spend $6 million on a large-tent shelter like Tacoma has had since last year. More than a third of the Tacoma site’s clients have moved into housing, a success rate that exceeded the performance of Seattle’s tiny-house villages in the first quarter of this year. To help pay for additions to the budget, the council would tap the city’s School Safety Traffic and Pedestrian Improvement Fund, redirecting more than $2.6 million in red-light camera ticket revenues, and would trim more than $2.3 million by asking every Seattle department to choose its own cuts. Council additions not entirely related to homelessness likely will include more than $1.2 million for a pre-arrest diversion program, nearly $400,000 for immigrant legal help and more than $260,000 for outreach to Seattle renters. The package does include measures that would boost council oversight over capital projects, including the paused First Avenue streetcar line. This article has been updated to reflect the full extent of proposed budget changes related to red-light camera ticket revenues and department-directed cuts.